TemplateHack.com - Download News Book premium blogger template. 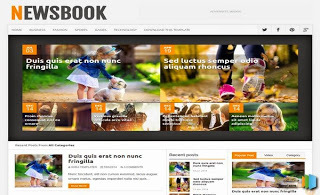 News book is a showcase blogger templates for those who need clean, elegant, and attractive template style to demonstrate our product. This template is adapted from Wordpress theme and has the option to select different layouts and this is a 3 column layout and 3 column footer. NewsBook template is a very good to use on the blogger, The default template loading speed is very fast. But it's not like the official template in wordpress, the original template is pretty much see, so you can use a custom blogger template with high loading speed.